Home > News > Interplay – 10 years together! 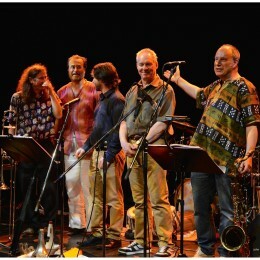 Interplay Jazz Group – 10 years Together Creating Music! In our fast-moving world it can be hard to find something that has been allowed enough time to mature and develop. Interplay is a band that has taken that time, reaching our current state of evolution through a journey of ten years. The band brings together the talents and experience of five exceptional musicians, each fuelled by diverse musical influences. Together we work on performing largely original material to make it our own. Alan Wakeman, (saxes, flute), and Richard Baker (trombone) form an unusual and well-balanced front line. Coming from very different starting points and bringing contrasting styles they have evolved a close musical understanding. Neil Hunter (keyboard), Adrian Litvinoff (basses) and Dave Balen (drums, percussion) weave together all kinds of dynamics – assertive, fluid, spacious and energetic, as the music requires. All the band are striking and expressive soloists. The tunes, mainly by bassist and leader Adrian Litvinoff, provide hugely varied settings for the band’s invention and spontaneity. He says “It is a serious privilege to have had these guys’ attention, musicianship and support over such a long period. It means I can draw on our mutual understanding to produce music that reflects each individual’s creativity, and also aim for musical realms that more temporary bands are unlikely to reach”. Also striking about Interplay is the range of audiences we have encountered over the years. In Jazz clubs, concert rooms and festivals, sure, but we have also played in churches, village halls, community centres, even the occasional stately home! We love playing to people who are enthusiastic and knowledgable about jazz, of course, but there is a different vibe and job to do when the audience has no real idea what they are going to hear. It’s our chance to help them savour something completely new! We try to do so without compromising the music in any way, and we find that people appreciate and respond to that. In recent years we have had the good fortune to perform in memorable concerts with some great guest artists. These include Claude Deppa, John Etheridge, Norma Winstone and Annie Whitehead, and thanks for this are mainly due to In The Moment, a voluntary promotions group based in Adrian’s home town, Leamington Spa. In May 2019 the band is appearing there with Alina Bzhezhinska and Tony Kofi in what promises to be a most exciting meeting of musical energies. Gilles Peterson called our second album Global “a beautiful record”.